We know odor doesn’t sleep or take a vacation…and we know that controlling t can be extremely challenging. Mist Works custom high pressure misting systems for odor control and dust suppression are proven effective, affordable, and are the most efficient method to relieve the headaches and demands of neutralizing and controlling odor. Also, our systems may help you avoid costly fines! Mist Works odor and dust control systems, along with humidification systems can be custom built to your specs or we can assess your needs and determine which products you will need to complete and maintain your own DIY system. 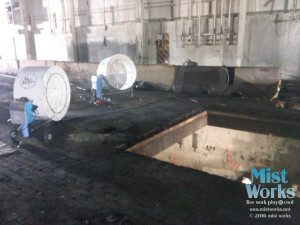 Large scale or small scale, we have the expertise and experience to help you. 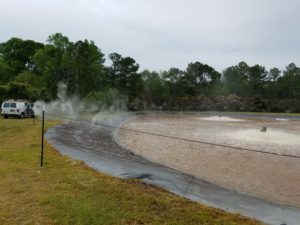 Our Technicians can install your misting system, build you a custom self-contained mobile system, or even assist your team in installing a system. A mobile portable misting trailer may be what you need! 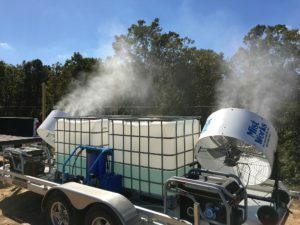 Click HERE for Mobile misters page for examples of custom trailers we have built for odor control and dust suppression needs. 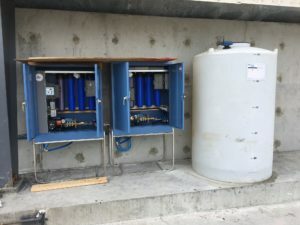 EXD Industrial Series mist pumps or WAVE models (variable frequency drive VFD) with viton seals can be fitted with chemical injectors, siphon mixers, variable frequency drives, additional filtration systems, timers and many other options and you can use your neutralizing solutions and natural enzymes with Mist Works systems. Our systems are proven effective for odor control and successfully being used in industries experiencing odor challenges, such as solid waste treatment facilities, waste transfer stations, landfills, transfer station, compactor rooms, slaughter houses, cannabis cultivation areas, processing plants, livestock waste areas, waste treatment facilities, chemical plants. Anywhere malodors may be present will usually benefit from a Mist Works high pressure odor control misting system. Are you an odor control chemical manufacturer or supplier looking to have mist systems private labeled for your organization? Give us a call, we can work with you. Call us at 877-647-8326 and let’s see how your business can benefit from having a Mist Works misting system.